Spring is here and I love it. It means work of course, and for me it’s hard to hit just the right balance of sitting around and actually doing something, but I try my best. One problem which always haunts me is that I’m the type who (again while sitting around) usually gets tons of unnecessary projects in his head, starts them, and then moves on before they’re done. Fortunately I’m not much bothered by this, but someone else here is, and sometimes decides to be helpful and remind me of the obvious…. but most of the time that person doesn’t notice unplanted chrysanthemum collections or realize it’s been years since the boxwood cuttings should have been planted out, so it all works out fine. How can it not when rain and rainbows and warm sunshine have brought out the daffodils? I’ve been relentlessly mulching. It started innocently enough with a load of mulched leaves hauled out of the woods, but then exploded from there. My neighbors were so generous last autumn with several heaps of nicely chopped leaves and grass clippings that I couldn’t stop lugging them back to the garden. The entire front bed got a nice layer and I would have kept going but of course ran through all the available bounty. The front perennial bed all nestled in with a nice mulch of chopped leaves. The earthworms will munch them all down by the end of summer but for now they should go a long way in keeping the weed seedlings down. Did I mention it was all free? As if that wasn’t enough, for some reason when finished I got it in my head to crack open the wallet and order a load of shredded bark mulch to finish off the yard. With most of the front already covered I felt finishing with a little purchased mulch might be something the budget could handle, so $290 later I was mulling over another new heap in the driveway. It seemed a steep price to me but judging from the other $1,000 plus order slips hanging next to mine I guess I’m being downright frugal. Also, mulch is a gardening expense the boss never criticizes, so now it just needs to be spread. More on that later, daffodils first! Always a favorite, ‘Tahiti’ is an awesome daffodil. Sorry if you’re not a fan of doubles, but this one never fails, and the yellow petals seem to glow with an orange shade which I love. I’m stuck on orange lately. 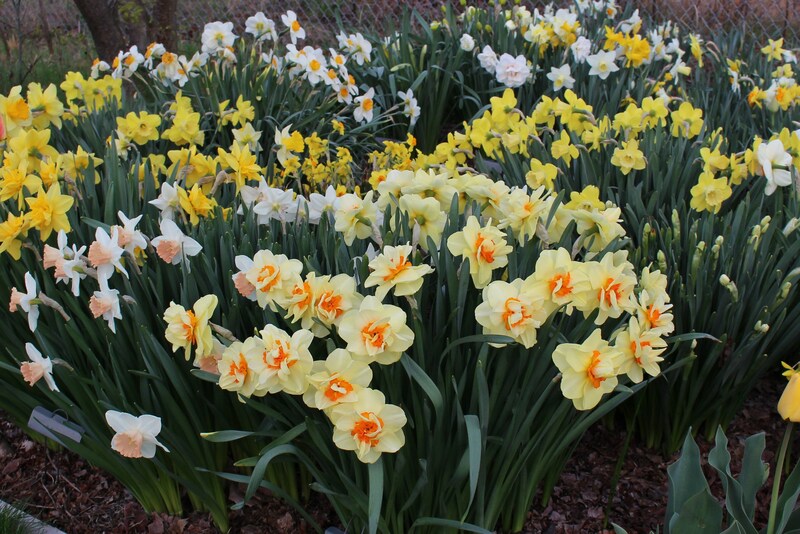 The daffodil ‘Serola’ tops the list this year. Narcissus ‘Serola’ with the first of the tulips opening behind. When I divide this bed (hopefully this June) I’ll need to put these out in the front garden to brighten things up even more! Although the vegetables complain, bulbs in general seem to like my lazy (or complete lack) of an efficient watering ethic. Tulips in particular like the open, sunny, fertile soil, and unless I weed them out (which I could never do) most clump up and bloom. Even if I do pull a few of the smaller bulbs they just end up in the compost anyway so get spread throughout the garden a few months later when I take and spread the barely rotted goodness. Yet another plant which needs to find a permanent home outside of the vegetable patch. This double hellebore seedling is taking up prime bean and pepper real estate. Believe it or not I’m making progress with my bulb issues. When I was younger and carefree I used to plant out patches of whatever tulips I had on hand and then dig them up again in June just in time to clear the beds for tomato planting. It was insanely beautiful (to me at least) and I can’t rule out this happening again. 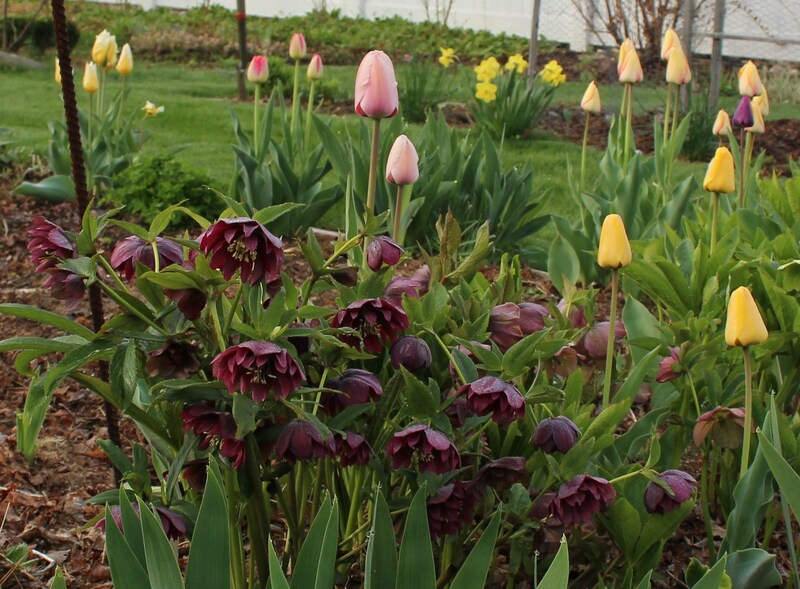 Tulips blooming in the vegetable garden (spring 2013). These would all be dug, dried, and stored while the warm season veggies occupied the same beds. Maybe my bulbaholism isn’t getting any better. Maybe it’s just migrating. 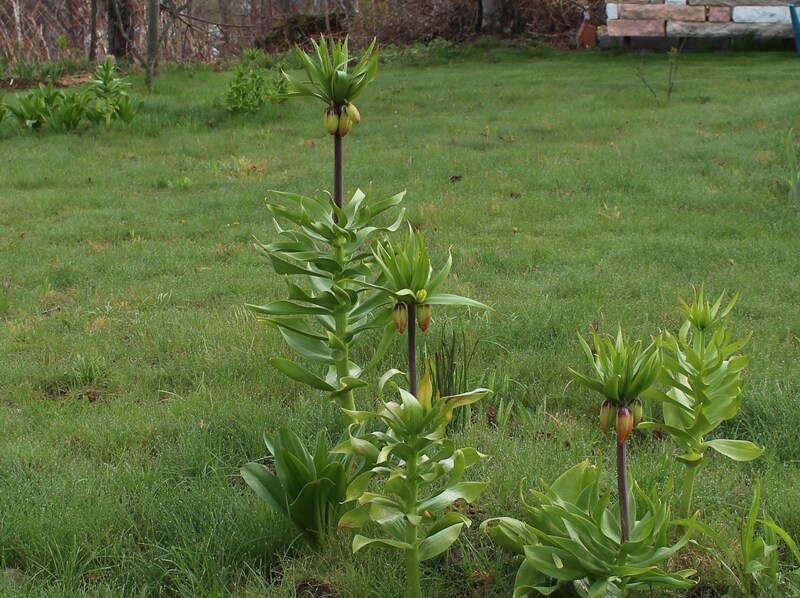 I planted these fritillaria imperialis bulbs out in the meadow late last fall (clearance bulbs) and can’t wait to see how they do. If I get one decent spring out of them I’ll be thrilled, but in my heart I want them to settle in… even if they do look slightly out of place in the short turf. Hopefully they enjoy the dry summertime baking this spot receives, and the grass should come up soon enough to hide the yellowing foliage. My ‘meadow’ is in danger of becoming a bulb field. The fritillaria imperialis don’t look entirely happy yet, but I have my fingers crossed they’ll at least bloom and then maybe return next spring? Out front I may have a few bulbs as well. Early spring is when I love the front beds the most. Tulips and daffodils where snowdrops ruled just a few weeks ago. I should have taken this picture today since I mulched yesterday afternoon, but after all the work I was ready to just sit and relax! Let me get out there then. Good luck on all your own spring projects, may they progress more quickly than my own! 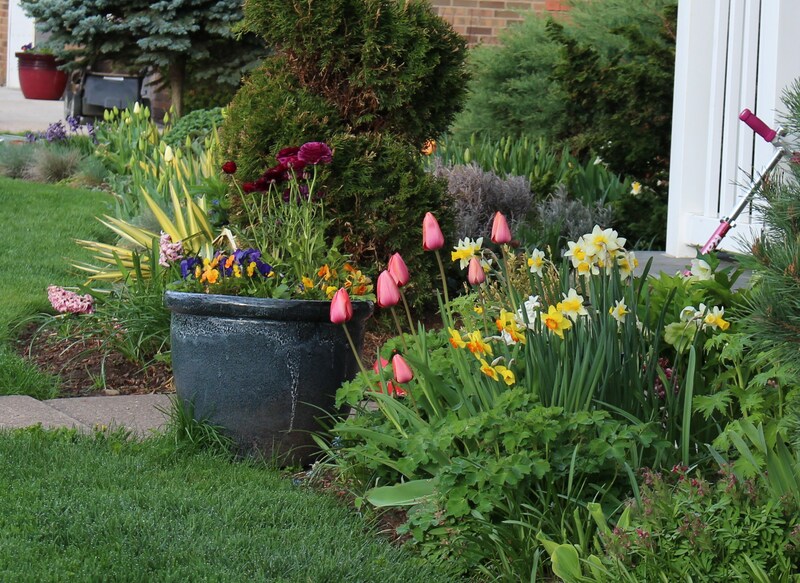 This entry was posted in daffodils, early spring, early spring chores, garden, meadow garden, soil prep/compost, spring bulbs, Uncategorized, vegetable garden and tagged daffodils, flowers, garden, mulch, spring, spring bulbs. If they ever established “Bulbaholics Anonymous” I will probably be among the first to join! Your beds are spectacular, and I would vote for that luscious hellebore over any veggies any day. 🙂 A question: with all those tasty bulbs, do you have a critter problem (well, other than the narcissus of course) to contend with? My neighbor recently told me that nobody in this neighborhood ever grows lilies because the rabbits chomp them down as soon as they come up…. Now you have me worried about my new lilies. I hope they are beyond the point of rabbit attack, but that’s one surprise I won’t be looking for. I think all the cats traipsing through the neighborhood help with the critter populations. In my last garden I grew lilies with no rabbit problem whatsoever — because a fox had its den in the overgrown underbrush next door, LOL. New people bought that house, cleared the property to 100% lawn, no more fox, rabbits moved in, lilies were history! 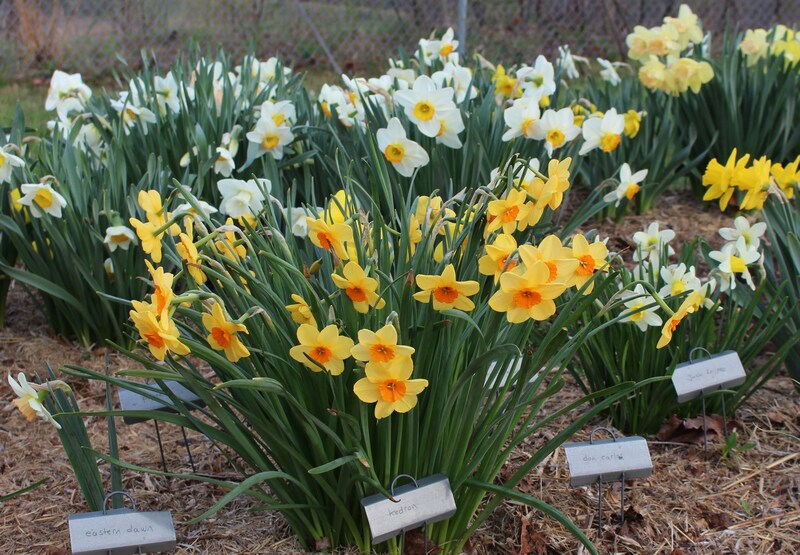 The labels are part of my quest to find the best daffodils. I’m nowhere near to succeeding, but it’s all about the journey isn’t it? Now my bigger problem is what to do with all the unnamed or wrongly named daffodils. For some reason on a cold, windy, and likely snowy November afternoon I seemed to think I would remember what I planted in the side beds. Now of course I don’t, and I’m stuck figuring out if I’m too much of a snob to continue growing them as anonymous flowers. What has happened to me!? Why is it that when we start to put down just a bag or two of mulch we end up wheeling truckloads of the stuff (and outspending the Defense Dept budget? Stay with it. Thanks John. I have to admit you can cover many a sin with a nice coating of mulch. My worst soil and most pathetic plants suddenly look completely luxurious when surrounded by the stuff, and it’s very satisfying. Quite a rainbow. Mulching is something I’ve been tackling lately too. Your borders look great. Lovely tulips. Thanks Susie. I start out thinking the pile will never end and then all of a sudden I’ve run out. but enough gets spread to make everyone happy. I’ve often thought a well planned tulip planting would be a good idea, but the Technicolor look makes me smile just as wide! I can completely relate to your bulbaholism. Spring bulbs are just too gorgeous to resist, and you’ve got some prime examples. I especially like ‘Kedron’ and ‘Serola’. Good luck with the mulching! I have to wait until June before I do that. You have some wonderful bulbs and I too am very impressed with your labelling. I instead leave myself cryptic notes such as ‘planted the yellow daffodils with orange middles near the red thingamy jig to the left of the rockery’! I can never remember the names of plants or find where I dumped the labels when I need them. I did label my snowdrops though – well the more expensive ones anyway. I am also thinking of getting a bark mulch for the top of my garden which is under big trees and very dry. I have a terrible job getting things to grow there and bark should make things look a lot better. Now where to find some cheap bags. . . . . I think Serola looks wonderful – must look out for it. You give me more credit for labeling than I deserve! I also have a book filled with odd notes about plant locations and varieties planted and small maps on who goes where. It’s nearly as much help as the labels since labels have a way of being picked out and played with, or caught up in electrical cords or hoses! I think you’ll like the bark mulch. The only problem is it looks so neat and well tended that every dropped twig and leaf seems like a mess… and I have plenty of those! The only doubt I have about the bark is the area is under mature trees and I am not sure how I would get up the leaves without removing all the bark too. 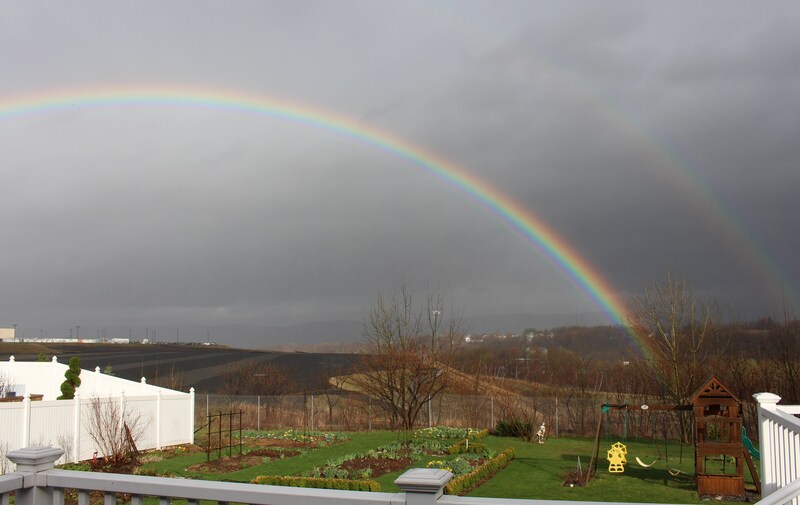 A lovely rainbow, and view across the garden, and soon the trees and shrubs will be leafing out to hide any unsightly bits. 😉 I like Kedron too, and all those lovely tulips in your veg bed! But it’s a lot of work digging them all out after…. I also like those neat plant name holders you have. I must try and find something like that as my tiny plastic labels sink into the ground or get pecked out by the birds! 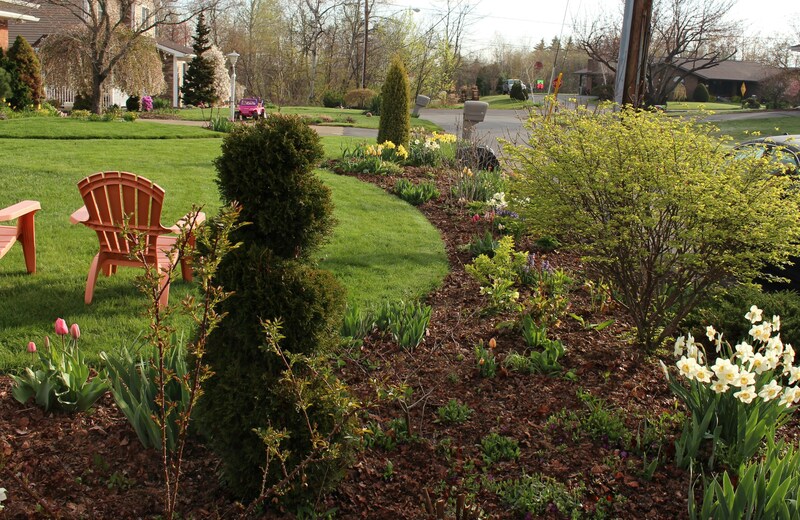 Enjoy planning that new bed around the golden shrub! I’m reading your comment three weeks later, and the mulch still needs spreading and the new bed has yet to be dug! Where is it that spring is going so fast? The trees have leafed out and next week promises to be a hot one. I’m going to have to admit that summer is near. I am mourning my tulip bulbs. 64 bulbs carefully chosen for color combinations and successive bloom times, arranged artfully and planted within the protection of the vegetable garden fence — ALL gone! Nothing but vole holes. So disheartening. I may have descended into the Slough of Despond for a while after that discovery. 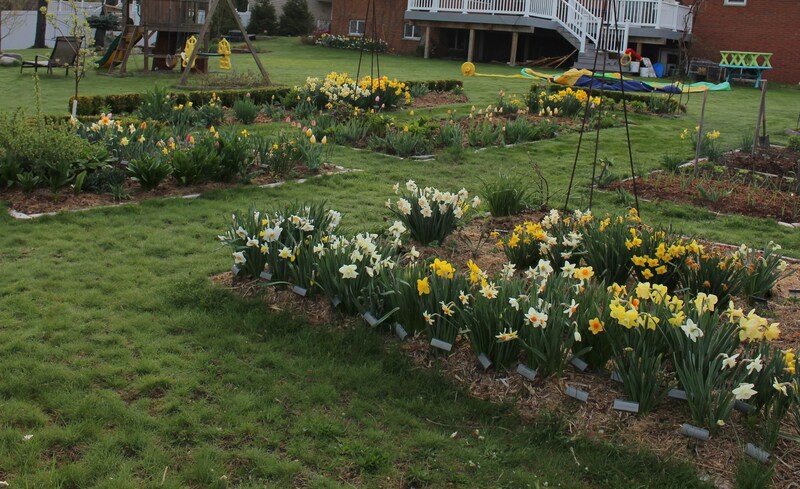 BUT, spring did finally come to the Highlands this weekend, and lots of daffodils are blooming. I planted ‘Kedron’ last fall, but it hasn’t bloomed yet. ‘Fortissimo’ is my currently blooming favorite! I wish I’d had time over the weekend to come see your gorgeous blooms! I’ve thought about your lost tulips a few times these past few weeks. I’m so happy with the areas I’ve mulched with leaves, but I don’t even want to think about inviting voles into my garden. They came into my gardens when I lived with my parents and it was a hopeless struggle trying to protect things from those voracious little monsters. There’s no way I want to repeat that. I can’t give up on my leaf addiction though, but next fall I might dump more into the compost area and only spread them once spring comes. The daffodil beds should be ok since they’re poisonous, but I really don’t want to provide any shelter, so maybe that’s got to be re-thought as well. I saw that spring is moving right along in the highlands, and I think I’m enough out of my funk to start posting and commenting again. For a while there I just wanted to sit around reading other blogs, ignore my own, and not bother leaving comments or even responding to comments left on my own. Sorry for the rudeness! I have loads of daffs planted out and about throughout the gardens and meadow but tulips are just not happy here or are a treat for the critters….I have loads of projects we are finally working our way slowly through…mulching and weeding are not among them yet, but will be soon…I have to get a handle on it….love the bulbs in your beds and how you work with them and the veggies. 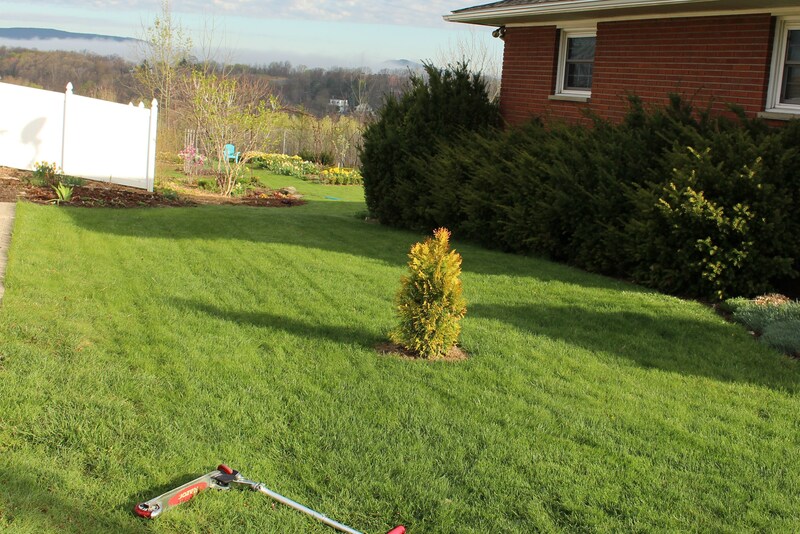 Hi Donna, Hope your projects are moving along this spring! Mine took a detour and there’s still plenty to do but I guess that’s the way it goes. I wouldn’t mind a little rain to make the digging easier, but I think once the heat sets in I’m going to call it a day and put an end to major outdoor projects. My tulips are lucky. The rabbits prefer the crocus foliage and we rarely get deer. I hope my neighbors continue to be avid hunters! Kedron and Serola look an awful lot alike to me. I love your tulips in the veg garden, but I have the same problem Kimberly does: very hungry voles. Ugh. I didn’t know you have voles. You have my sympathies! How can you say Kedron and Serola look alike!? One’s yellow and orange and the other is a completely different yellow and orange 🙂 I guess it’s kind of like snowdrops eh? Or may be it’s my eyesight looking at images on a computer screen. I’m sure in person I could tell them apart. No it’s not your eyes, I have many a daffodil which I can’t tell from another similar one…. even when grown right next to each other I sometimes still can’t see it! You are just too darn organized! 😀 Beautiful tulips and everything labeled!!!! I so love tulips, but you have a fortune in bulbs there. That much bill is a drop in the bucket to all those bulbs. I admire how well your gardens are looking, so anything you did not do yet is not even noticed. Haha, I’m not nearly as organized as you might think, and as for the costs of all those daffodils, most were given to me or started as a clump of one bulb. With a little patience and a good spot in a vegetable garden they clump up nicely! (most of them that is, I have my slackers as well). Now I give away hundreds each fall. Ha, I too ran the sprinkler. We did not have rain for 1 month. It looked like storms so many times too. I even wrote a post to come on our no rain because big storms are predicted for the Fling. Luck (or no luck) might have that the time we get the rain! All that lovely mulch, how fabulous. I wish someone would come and spread some here, I can’ t be bothered. How quickly your spring garden has come on, it all looks lovely.I am impressed by your daffodils and their labels. You have some beauties. I am usually so pedantic and bossy about getting plant names right but daffodil and fern names pass me by. I must try harder. Funny how keeping track of plant names can be such a sport. I’m determined to have the names and know exactly who is who in the daffodil patch, but for me bearded iris are a plant where I don’t worry myself a bit over identities! You’ve been quiet lately, I’m looking forward to your next post! I have been in Ireland for a couple of weeks and I am afraid I have got a bit behind with blogging as there was no chance to keep up there. The garden calls, but I will be writing a new post soon. Nice that you noticed. 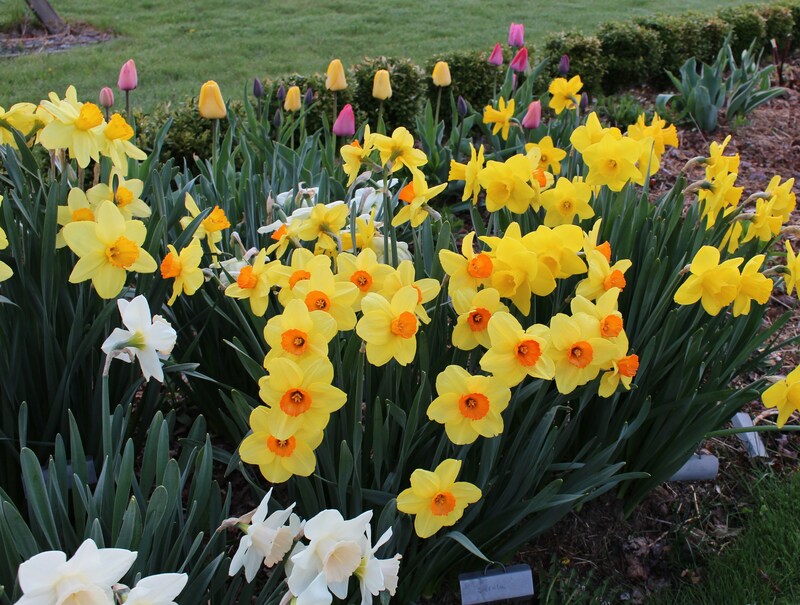 What a beautiful daffodil collection you have! And I do like the tulip bed. – I might end up planting something alike this fall. As for all the projects, I keep telling myself that around the garden, you will never be finished… so be it. Thanks Felix, and thanks for the comment. I agree it’s just not worth worrying about unfinished projects. My neighbors have been a little concerned about the yet to be spread mulch, but I’ve been enjoying other things. It’s no fun when it becomes work! Why not leave the tulips and create a cuttings bed for cut flowers? Love all the daffodils, you have masses, lots of envy on my part!